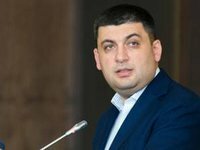 The Verkhovna Rada of Ukraine has endorsed Volodymyr Hroisman of the Bloc of Petro Poroshenko as the chairman of the parliament of the 8th convocation. A total of 359 MPs voted for this decision on Thursday. Hroisman was nominated by the majority coalition and was the only candidate for this post.